April 25, 2018 Emily V.
This is me trying to branch out from always wearing a t-shirt; it won't last long I'm sure. LOL. I think this outfit is a great example of adding a new piece to freshen up your current (aka old) wardrobe. We've all been there where we have felt a bit 'blah' about what is hanging in our closet. I don't have much turnover in my closet. I hold onto the things I love and will continually wear them well past their stages of retirement. This is where adding a new piece can breathe new life into your closet. For me, that new life is this gingham shirt. Whenever I see gingham I think of picnic tables and men's dress shirts. That pattern seems to thrive in those two areas. Since I tend to keep my patterns a bit minimal, gingham doesn't scream busy or loud. If you opt for a subtle color duo such as black and white, it can be a very flexible print that you can easily pair with anything. I love this outfit as it's a great mix of my styles - a little edgy yet put-together. 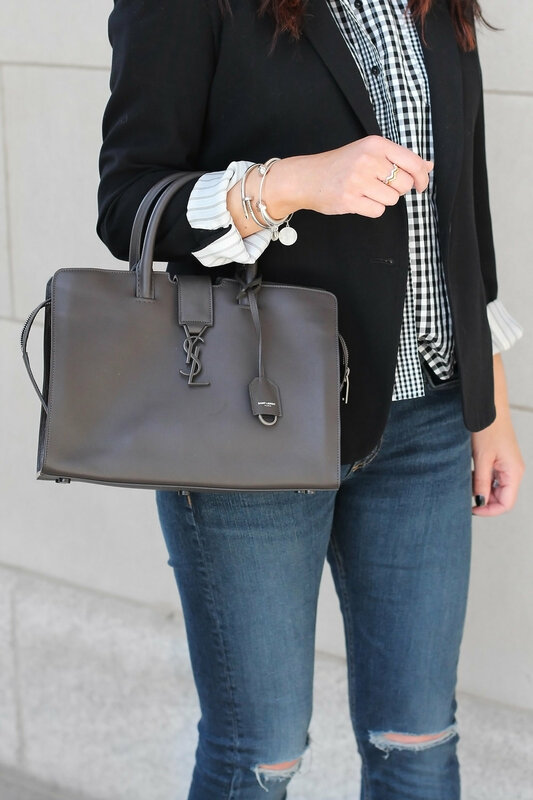 You can easily forego the ripped jeans for a non-ripped pair and this look is perfect for a casual day at the office or for a weekday lunch date. And who doesn't love those?! You can shop exact items (if they are still available) below and similar items that are less than $100 in the next section.